My collection of cycling clothing is pitiful. A few years ago when we downsized I got rid of all the old stuff. Marco’s long-sleeved Chazal jersey that he wore in the Tour, my old Molteni jerseys (wool, of course), and the various iterations of miscellaneous club outfits. Big O, Cynergy, Ironfly, even my old SPY stuff. Now my cycling closet has nothing in it that is more than two seasons old. 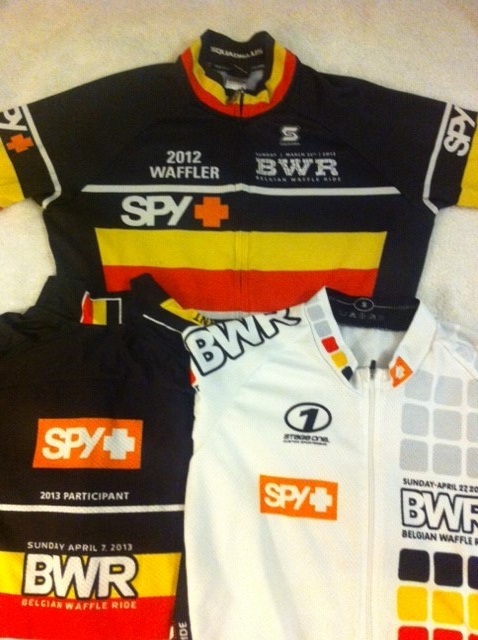 However, in my chest of drawers I’ve saved three jerseys from the recycle man — my Belgian Waffle Ride jerseys from 2012, 2013, and 2014. Unlike a lot of other jerseys I’ve worn, these three I actually earned. And if you’ve signed up for the 2015 edition, which promises to be longer, harder, dirtier, and grittier than the previous three, what follows is some advice — some real advice — about how to earn yours. I’ve broken it down into four approaches. Pick your poison. The 2012 Approach a/k/a “Win it!”: The first year I trained hard and did several BWR prep rides to learn the layout of the course. I envisaged a hard day in the saddle, and somewhere over the 119-mile course I would either contend for the victory or slog it out for a top-ten finish. I got dropped on the very first dirt section. By the time we hit it I was already gassed, and I stumbled along, blind and in confusion, for the remaining hundred miles. The 2012 Approach is not recommended. I vividly remember sitting in the finish area, starving and thirsty, having forgotten to bring money for food. If Christine Marckx hadn’t bought me a hot dog I wouldn’t be here today. The 2013 Approach a/k/a “Survive it!”. The second year I trained even harder and did even more prep rides. Knowing the impossibility of a good finish, as my name isn’t Neil Shirley, Brent Prenzlow, or Phil Tinstman, my goal was simply to do respectably. Unfortunately I got caught up in the excitement of the first dirt section below the bike path and fell off my bicycle trying to climb the stone wall from the dirt and gravel back onto the path. By the second gravel section I was gassed. Dave Gonyer blew by me en route to Couser Canyon, and then so did a hundred other people. This 130-mile miseracordia left me crushed and destroyed at the halfway mark simply because I had given into the temptation of “go hard” so early. The 2014 Approach a/k/a “Enjoy it!”. The third year, although MMX insisted on placing me in the first wave, I dropped off as soon as I realized that in the “neutral” zone we were cranking out 500 watts on the rollers. I fell back with Pilot and Junkyard, determined to ride at my own pace. Junkyard got sucked into the enthusiasm of a passing group on the dirt track after Lake Hodges, and sprinted off. “Junkyard!” I said. “Don’t!” I saw him at the 80-mile mark bending weakly over his bike as he tried to make sense out of the phrase “39 miles to go, and they’re the hardest ones with the most vertical and the most dirt.” I rode steadily the whole day and finished tired but not destroyed. 131 riders finished ahead of me, but none of them looked very good. This was the only BWR I’d done that I would call a success. The 2015 Approach a/k/a “Share it!”. The fourth year I’ll also train hard and I’ll also ride my own ride. There will be no getting sucked into the unwinnable competition for me–I’m even less Neil Shirley than I was in 2012. But unlike last year I’ll have a small group of riders who’ve been fileted and left for dead in previous years, who now know that the BWR is not to be conquered, only to be completed. Because whether you’re second or seven hundredth, the finisher’s jerseys are all the same. For $2.99 per month you can subscribe to this blog and get the best tips for finishing the BWR in one piece. Click here and select the “subscribe” link in the upper right-hand corner. Thank you! Those jerseys belong in a trophy case, sir! Well played, Wanky. Well played. If you’re still here to talk about it, you’re a winner! You seem so surprised to be passed by Dave Gonyer! Ha! Nope. Just demoralized by the crushing speed. I took your advice to heart last year, and spent the first 4 hrs, telling my self don’t even think about pedaling hard, at 6hrs I still felt good and I survived the last 2hrs. I rolled in 265 tired but very happy, after a great adventure. I’m using the same tactics this year and the 32 cassette. Yep. Big rear cogs, take your time. It’s gonna hurt no matter what! 2012 Approach is the correct strategy. Ha, ha, ha! I still remember you at the last feed stand before Bandy Canyoni in 2012, grabbing like a crazy man for the last scraps at the feed station! “That’s what it looks like to be drowning,” I thought. See you on April 26! it would be another 30 mi before I first met you. Everyone’s going down in flames this year – might as well make it monumental! April!!!!!!!!!!!!!!!!!!! Finisher’s jersey? Really? I was just doing it so that I could win back a heaping pile of humility. I’m about to put on the old 9 speed XTR rear derailleur, and an 11-34 cassette, with a compact front. 34-34 sounds dreamy. I knew I wanted to be able to comfortably climb Highland Valley in the saddle. You’re spot on about the humility profit margin! HPM to us corporate wonks. I knew it had an acronym. « The greatest masters racing team of all time? You are currently reading Three jerseys at Cycling in the South Bay.